For much of the 19th century and all of the 20th, Germany had been history's problem child. An inveterate starter of wars, it reached its zenith as a mass-murderer of consummate barbarism during World War II, and though ultimately defeated in 1945, yet continued to plague the latter half of the American Century in the novel role-reversal of victim. Threatened by the Soviet Union, it took central stage again in 1948 when that co-occupying power tried to force the others - France, England and the United States - out of Berlin by imposing a land blockade around it. The geography was complicated (who controlled what sector) but the response was simple: the West, from the end of June of '48 to the end of September 1949, flew over 200,000 flights into Berlin, bringing such necessities as food, fuel and medicine. The Soviets, fearing an armed conflict, ended their blockade in May 1949. Berlin was saved - for then. But the Soviets, both during the Eisenhower and Kennedy administrations, continued to stir up trouble with and over Berlin, but it reached a high point in August 1961, and it was this new "Berlin Crisis" that prompted Dean Acheson, Truman's ex-Secretary of State and dear friend, to write his old boss. Your somber note gave me the most depressing viewpoint I've had since Jan 20th 1953. I can't agree with you. We saved Berlin once. We will have to do it again. The Russian Dictator [Khrushchev] is one of those who can't face issues when they are met head on. You must remember that our head of state is young, inexperienced and hopeful. Let's hope the hopeful works. 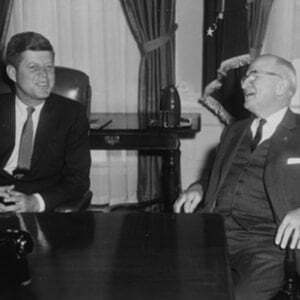 Truman’s support of Kennedy, however, had not come naturally. In the 1960 primaries, he had supported Missouri's Senator Stuart Symington - and in so doing, publicly attacked JFK as immature and inexperienced. Kennedy's July victory at the 1960 Democratic Convention left him "blue as indigo" he confessed, writing to Acheson in August and he "stuck with taking the lesser or the most of two evils - or none at all". Because Nixon was impossible, he said, he was "taking the immature Democrat as the best of what's before us." But Jack Kennedy called and courted, and ultimately Truman, at the age of 76, campaigned for him in nine states. The day after Kennedy’s inauguration in January 1961, Truman was welcomed back into the Oval Office for the first time in eight years. And as for Berlin? Kennedy's deft handling of the crisis, and his "Ich bin ein Berliner" speech delivered in Berlin’s Rudolph Wilde Platz on June 26, 1963, defiantly proclaiming that Berlin's struggle against communism was the proud fight of free men everywhere, were high-points in his tragically truncated presidency. "He was a good man, an able president," Truman summed up, on hearing of Kennedy's assassination, "he did a good job." Autograph Letter Signed ("Harry"), 1 page, octavo, on his personal letterhead, no place [Independence, Mo. ], September 25, 1961. To his former Secretary of State Dean Acheson. In response to Acheson's letter to Truman dated September 21, 1961.